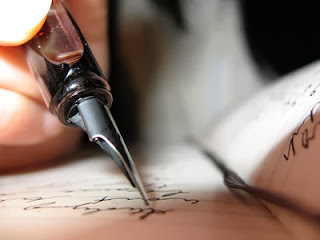 When was the last time you wrote a letter? Last week? Last month? Last year? Have you ever written a letter? I'm not talking about writing a letter to your bank or your gas supplier, or even to your child's teacher. I'm talking about good old fashioned letters that you send to your friends and family. I have recently taken up writing to my friends because they are all away at university. I know I could text them or Skype them but writing a letter is fun for me and I think just that little bit more personal. There is nothing more exciting (apart from opening your stocking on christmas morning) than seeing your name on an envelope on the doormat. For most of my life the only letters I've received were from my bank telling me I have no money (does this ever change?). Apart from thank you letters the only letters I remember writing were to a girl I met on holiday in Corfu when I was seven or eight. I received very few letters until I went to University. Then everything changed. I received letters from my step mum and my aunt (I used to goad them on so that I would get more letters!) and occasionally from my friends. This was great. I loved getting them but I never really thought to return the favour. It seemed like something that would take ages to write and I would have spoken to them to tell them all my news in the letter before they received it. Today I got up at 11 and had breakfast. I checked twitter for as long as I could muster and then decided to get dressed. I looked at a couple of job applications but it was almost lunch so I stopped. I went shopping in the afternoon but didn't have any money so came home. I'm going to watch Lewis AGAIN tonight because there is nothing else on. I spoke to you on the phone yesterday and relayed all my news so there is not much else to tell you. I'm going to have a cup of tea now. Speak soon. Nobody wants to read that now do they? So I decided that comedy was the best form of writing - writing as somebody else or as an exaggerated version of my self. I have written letters to my friends explaining to them why I want to live in sherwood forest with robin hood (well who wouldn't?). I've sent letters as Rose from Titanic expressing her love to Jack. I've sent letters about overhearing a conversation with two middle aged women who want to start a war on poo. I've sent the most random letters that I hope have brought a smile to some of my friends faces. That is all I've ever wanted to do - make them smile. That is what I think a letter should do (unless you're delivering bad news but maybe don't write bad news in a letter?). You can do it in your own way, write what you want, as long as your recipient smiles when they're reading it. Give it a go. Make someone smile. It doesn't have to be long, maybe start writing postcards before moving onto full size letters. It's really rewarding and you might wake up one morning with a reply on your doorstep that makes you smile. Do you know, I think I might possibly have forgotten how to write! That's how long it's been since I've written a proper letter. A fantastic idea of yours, though - good, old-fashioned charm. It's been so long since I wrote a letter - I find writing feels really strange when I do do it for any length of time - sad isn't it? No not at all! I'm normally very ambitious with my letters but after the first page my hand starts to hurt and my handwriting gets worse and worse!